These were made with scrapbook papers, metallic paints, stencils and some rhinestone embellishments. 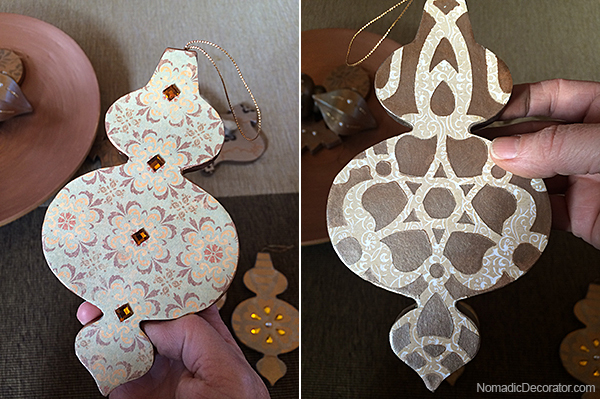 Today I’ll show you how to make Christmas tree ornaments like these. They look luxe, but they’re super easy! 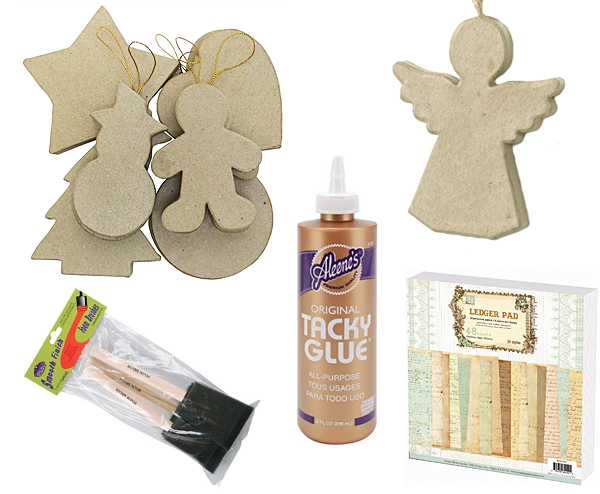 You can find these supplies online or at any major craft store. The curvy paper mache ornaments I used were found at a Hobby Lobby store. I haven’t found the same ones online. You can also often get ornaments on sale up to half off, or use a coupon which brings the cost to only $1 to $1.50 each. Choose an ornament and a scrapbook paper. You can use any scrapbook paper you want and there’s thousands of designs available in stores and online. 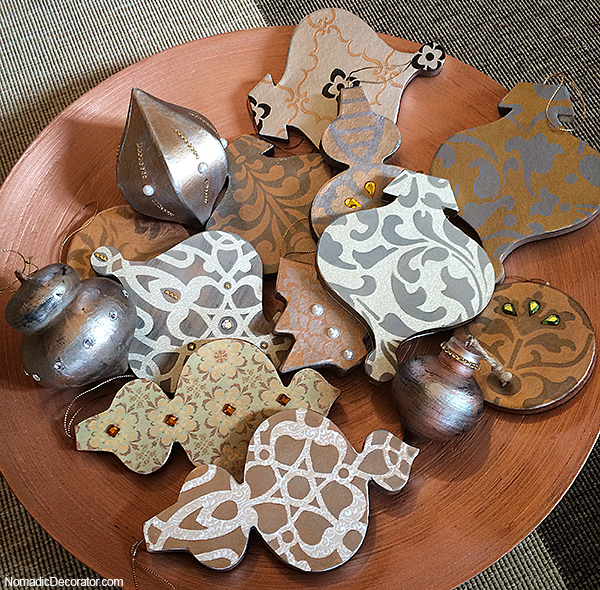 But if you think you also want to paint stencils on your ornament to make layered patterns, it’s best to choose a lighter color paper with a more subtle pattern. Something like the Prima Ledger Papers at Amazon. Some scrapbook papers I used were glittery so that’s another option for a fancy festive look! Step 1. First, paint the edge of your ornament. I used metallic paints but you can use whatever color you want that coordinates with your scrapbook paper. Step 2. 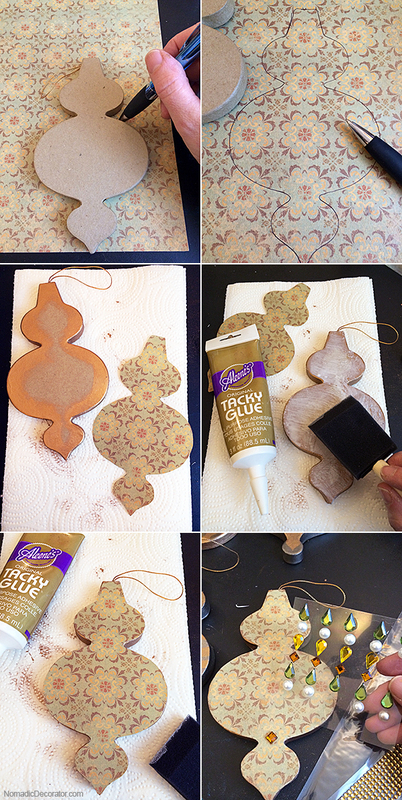 Trace your ornament shape on scrapbook paper and cut it out. 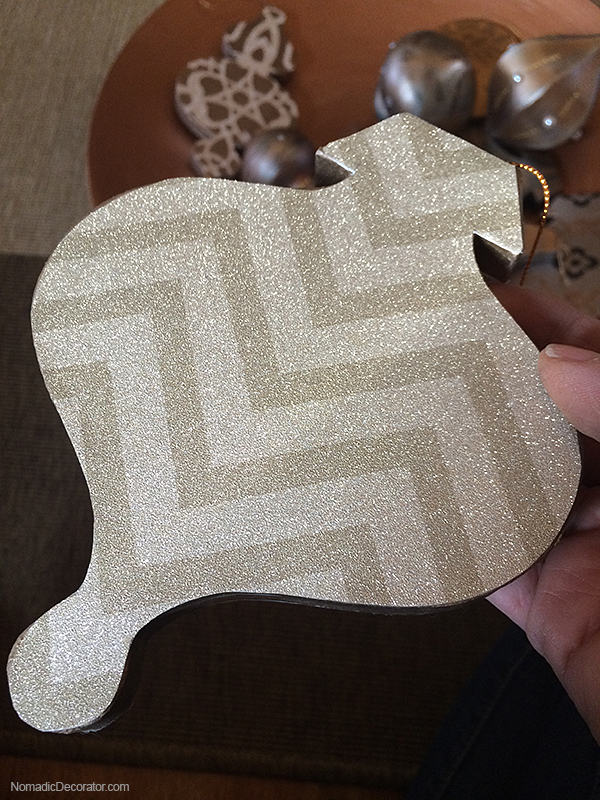 TIP: Cut slightly inside the trace lines, so your cut-out won’t wind up bigger than your ornament. Step 3. 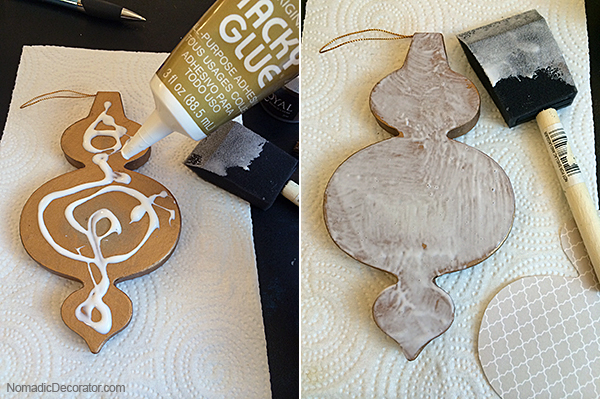 Next spread a light layer of Aleene’s Tacky Glue on the ornament with a foam brush. TIP: Mod Podge is very popular and you may have some in your craft supplies. I’ve used Mod Podge as a glue for a few scrapbook paper projects, and had wrinkle problems with all those projects. I tried every solution I found online to minimize the wrinkles. It helps to use a thicker scrapbook paper, and to smooth the paper from the middle toward the edges with a hard straight edge like a credit card or ruler. But I still had wrinkle problems. So I tried Aleene’s Tacky Glue instead. It’s less wet, more tacky, and I found even thin papers did not wrinkle. Yay! So based on my small experiments thus far, try Aleene’s Tacky Glue instead of Mod Podge if you’re gluing scrapbook paper. That doubled the creativity, but now I’ll have a hard time deciding which side to show on the Christmas tree! You can cut apart rows of rhinestones to use smaller pieces. And if the sticky backing comes off, as it did for a few of my rhinestones, just use some of the Aleene’s Tacky Glue to adhere them. Next I’ll post a Step 2 to this tutorial, with info about stenciling on scrapbook paper to make layered patterns. Visit it here. 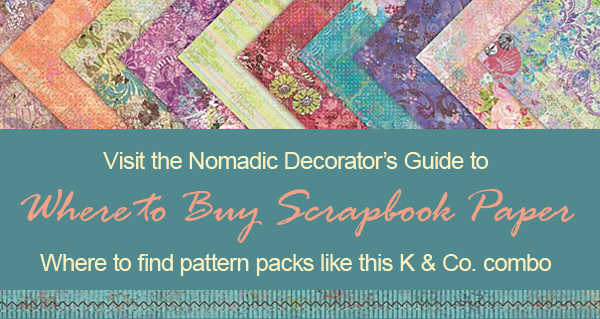 Wondering where to buy scrapbook paper? This post contains affiliate links, which means I receive a small percentage of compensation at no cost to you if you purchase after clicking the link. I post affiliate links when I have purchased from the company or used the product, and I can confidently share the company or product. For more info, see Disclosures & Policies. Love this idea! Better to make than buy. So glad we signed up for your newsletter. Thank you Lis! 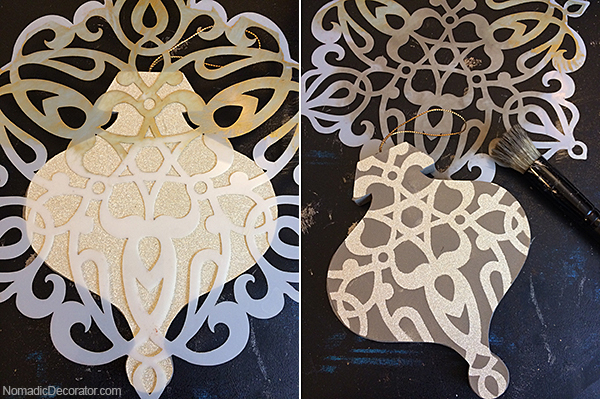 I found these ornament shapes in a Hobby Lobby store in Illinois and my mom found them in Hobby Lobby in Michigan, so if you have a Hobby Lobby nearby, they may be there. The tag says they’re made for HL so this shape isn’t likely available elsewhere. The model-making cardboard sounds like a good idea – you can make any shape you want! I like these elegant curvy shapes! Thank you! 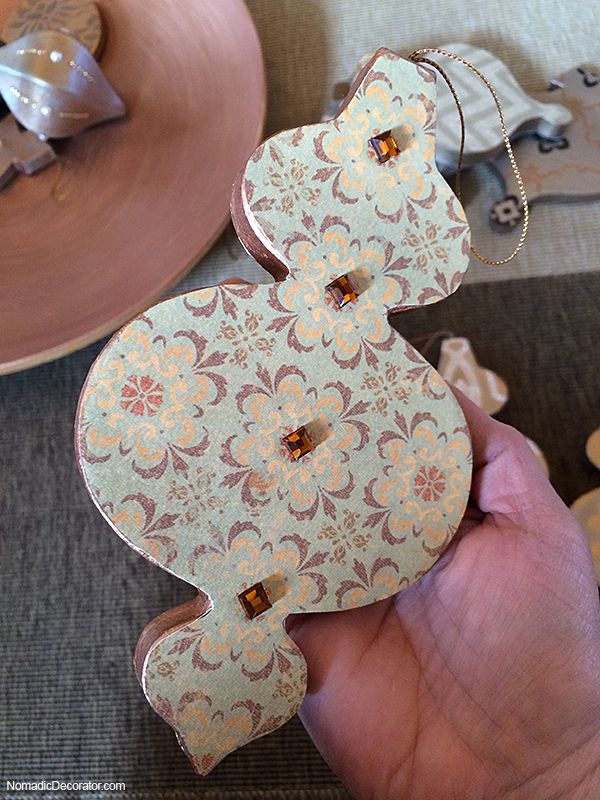 Yes, so many colors, textures, so many ways you can make these ornaments with scrapbook papers! As a preteen I traced animal shapes on cardboard, cut them out, glued fabric and sewing notions on each and had a very uniquely decorated Christmas tree. My mother said it was her favorite of all she’d ever seen but she may have said that because she was mom! Previous PostPrevious Design Trend: Detroit! Yes Detroit!